Skate It is EA’s latest skateboarding app for the iPhone. 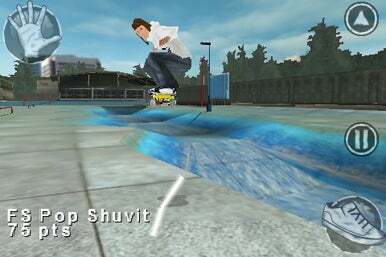 Based on the popular Nintendo DS game by the same name, Skate It features real brands, a ton of customization, and a unique—but not necessarily easy or convenient—“flick it” method of controls. An additional feature allows you to replay a series of tricks you've performed in-game, so you can show your friends and family how awesome you are at iPhone skateboarding. It doesn't look pretty but at least it drives pre...oh, nevermind. There are two modes—free skate and career mode. In free skate you get to skate around for an unlimited amount of time and practice, while career mode has you going through 20 different levels, during which you must complete a number of challenges for each level. Challenges include tricks, races, and photo-and-video shoots. They come in a nice variety of levels (some can be completed quickly and easily, while others take over half of your day). The career mode unlocks an incredible amount of skate gear (everything from hats to wheels to trucks), which you can then use to customize your character. But as much unlockable content as there is, Skate It’s controls are a mess. They’re a mix of accelerometer, virtual buttons, and complicated finger-swipes across the screen. To push off (accelerate) and grab the board (for tricks), there are two virtual buttons in the corners—the shoe button in the lower right corner for pushing off with your foot, and the hand button in the upper left corner for grabbing the board with your hand. To turn, steer, and gain momentum, you use the accelerometer. And to perform tricks, you do a combination of finger-swipes across the center of the screen. There are a number of different multi-touch-like gestures for different tricks; for example, a single line directly upwards is an ollie. While these “flick-it” controls are a novelty, they’re not exactly great for an iPhone game—there’s a pretty steep learning curve as you figure out all of the different finger-swipes and attempt to do them while tilting your iPhone to turn. There is an option to “slow time” so that you have more time to perform finger-swipin’ tricks, but I found this option to be of little help (it really just made everything slower and laggier). Of course, while the learning curve is steep, it’s not endless—with a considerable amount of practice, you do get better at controlling your skater ala sweeps and swipes. That said, even as you get comfortable with the controls, they sometimes fail to respond—finger-swipes don’t always register perfectly, and the game often lags, which can be fatal if you’re in the middle of a complex trick. Graphically, Skate It is sketchy. Players have a choice of playing as one of the pro skaters, or making their own skater. While the vast customization options (clothing options include real skate brands, such as DC and globe) are impressive, the skaters are awkward-looking, blocky, and all look exactly alike despite the extensive customization. The environments are a bit better, with more detail and a lot of space. Skate It is not as much of a train wreck as I’m making it out to be—after all, it does have a ton of playability and a lot of nice customization options. That said, the controls are awful—confusing, not at all intuitive, and really hard to get used to (and by the time you do get used to them, you’re so frustrated with the game that you’ve thrown your iPhone out the window). If you’re looking for a good skateboarding game port, I recommend paying the extra $3 for Tony Hawk Pro Skater 2.